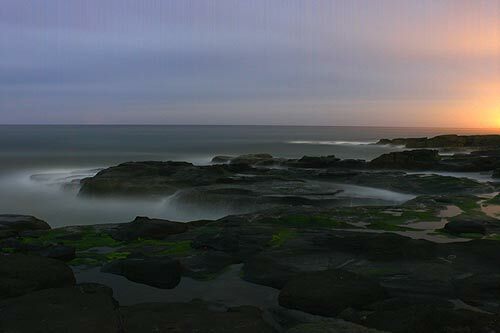 (Yachats, Oregon) – That ever-present dynamic of wave pyrotechnics that this central Oregon coast town is known for doesn't stop at night. It’s harder to see in the dark, yes. Until you’ve got your eyes trained to the dim light. 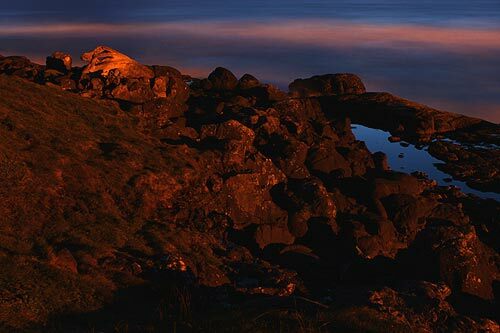 But those same spots and crevices in the basalt structures of Yachats still fire up in the air and the waves do their intricate little dances beneath the stars. In fact, the noise becomes more apparent at this point in the Earth’s cycle. It’s a bit more of a looming presence. 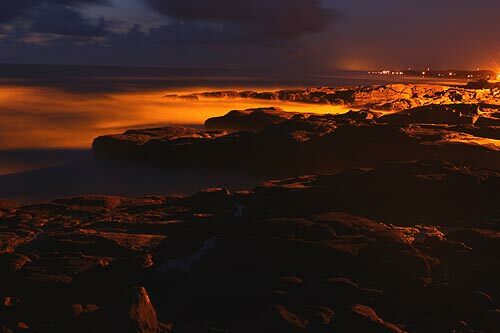 Yachats at night is both hauntingly beautiful and slightly unnerving. Those massive sounds made by the ocean are much more alarming, as they sound much closer in the dark. The big plops, splashes and small explosions are much harder to discern in terms of their relative distance from you, and therefore there’s an element of a thrill ride to all this raging beauty. Keep to the spots above the rocks and you’ll be fine. Never go down on them at night, no matter how many flashlights you bring along. These rock structures are dangerous enough during the day. In any case, it’s part thrill ride, part exercise in an otherworldly beauty. And it should be experienced by everyone. These basalt behemoths become even more like an alien world after dark. The platform at the main beach access (above) is probably the most comfy. 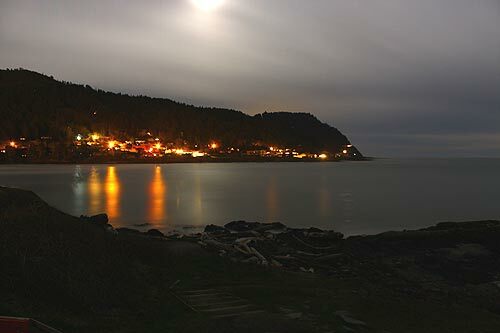 From here you can see the lights reflected on the water of the bay and the incoming waves, and see that promontory at the southern end of Yachats lit up in a way that’s unforgettable. All of a sudden, Yachats appears much bigger than you thought, really. Especially on this night, the moon lit up the surroundings in such a stunning manner. It was here, around 1 a.m., I saw something remarkable I still can’t quite explain. Something fired off high in the sky. Either it was a massive shooting star streaking across the sky in a huge arc – and then diffused by the hazy, thin clouds – or it was that phenomenon known as sheet lightning. But this appeared to shoot across the sky from one direction to another – and it was incredibly bright to be seen in such a way through those clouds. There was a sense of movement. So I’m guessing it had to be a meteor and not any kind of lightning. No thunder noise happened either. All I know is I jumped for joy and screamed with the delight of a little boy. It all added to that alien world aesthetic of the place: you could’ve convinced yourself you saw a spacecraft. Over by the 804 trail, the floodlights from the Adobe Resort (above) allow guests to see those waves at night, and they create an ethereal glow on everything around them – on land or at sea. Further north, down by the Fireside Motel, these massive waves continued to pound and shoot upwards. But because you’re photographing at night, and taking long exposures of several minutes or more, the sea becomes a huge blur. It becomes a silken mist with a weird life all its own. Closer to the Overleaf Lodge, those giant craggy openings continue to squash the waves and then cause them to release upwards. What you can’t see here is the constant sea mist this creates, which requires frequent wiping of the camera lens in between shots. 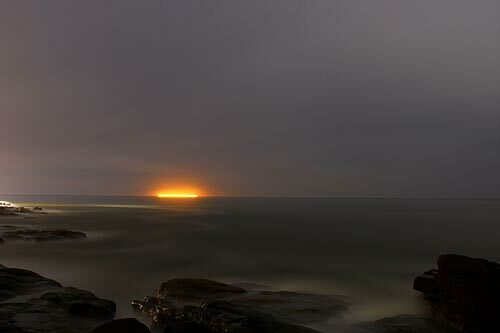 A ghostly glow comes from the north, caused by lights from buildings which are then diffused by the thick ocean air, and apparently made larger and more omnipresent. Numerous vantage points with benches sit along here. At times they are 20 feet from each other. One contains a nifty lookout eyeglass. If you think things look the same every night you’d be wrong. 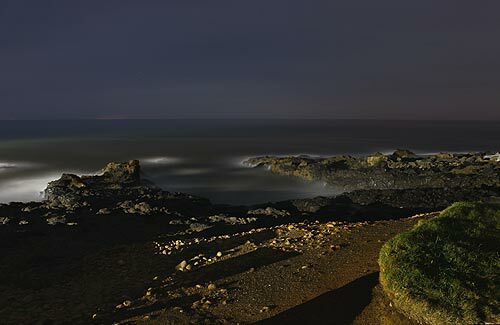 A night or two later, someone has fired up a yellow floodlight on a building next to the Overleaf Lodge, and this casts a predominant orange glow onto the rocks and surf. This significantly changes the scene. The deadly power of Yachats' waves is always being reminded of in one way or another. A gargantuan chunk of driftwood sits up high, near the trail, substantially above the usual waves. This thing probably weighs a ton or two, and it could’ve only come to rest this far by traveling on a massive wave. That must have been one heck of a storm. 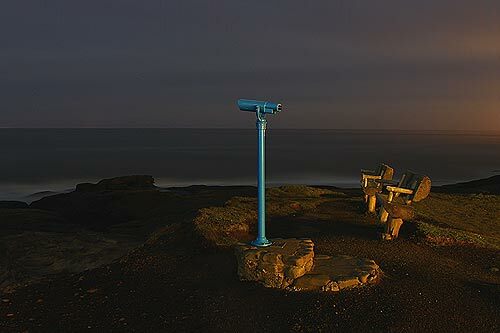 Again, looking out along the stretch near the Fireside and the Overleaf, that orange cast lights up the waves and rocks in some striking ways. It’s all a bit reminiscent of the beginnings of this area, actually. All these basalt structures were once enormous flows of lava. It’s not hard to imagine you’re looking at Yachats several million years ago, as gargantuan lava monsters seared their way through this area, and into some sort of primordial soup that was the pre-Miocene ocean, or whatever existed here at the time.